New Financing Option Now Available! Home » deBebians Fine Jewelry Blog » New Financing Option Now Available! Last Thursday, we rolled out a new financing option for our clients in partnership with First Mutual Financial of Ohio. This new option is in addition to our options of PayPal Credit and free layaway. All three options allow you to pay for your purchase, such as an engagement ring, over time. 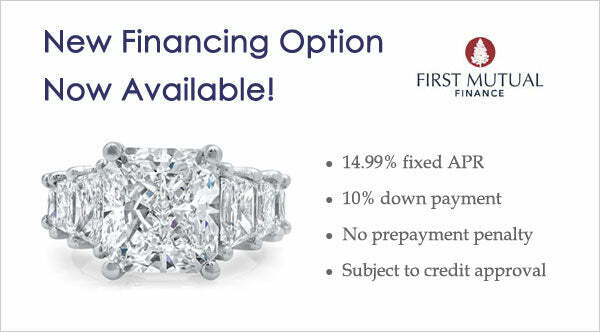 We’re excited about this offer, because it allows you to get your jewelry in a timely manner after placing your order and enjoy a competitive interest rate of 14.99% fixed APR. Our customer service representatives are happy to assist you and walk you through the process, or you can apply online and get a decision immediately. This financing offer requires a 10% down payment, payable by credit card, PayPal or bank wire. To assist you with the math, we have available a loan calculator. Here’s an example of what you’ll see when you use the loan calculator. 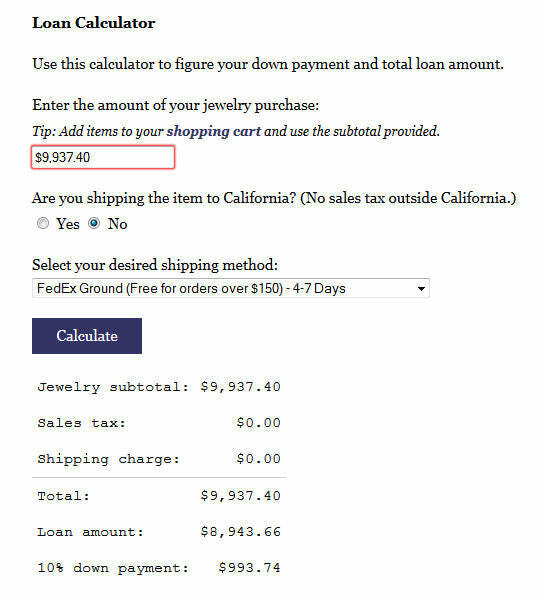 You can plug in any amount, choose your tax setting and shipping option, and then click calculate. The calculator will figure the 10% down payment and loan amount. In this example, over a 60 month period, monthly payments would be $213. You can preview the monthly payments by clicking “Apply Now” on our financing page and then plug in the cash price (jewelry subtotal + shipping charge), sales tax, and cash down payment figures into the credit application form. The credit application form will automatically generate the monthly payment amount. You can then choose from six months to 60 months to see what the monthly payment amount would be over that time period. If you have any questions or would like assistance, please contact us. To get started or to learn more, click here.